Once again, a large American corporation has done something to alienate what is arguably the majority of American consumers by being completely tone-deaf and out-of-touch with a huge swath of the country. 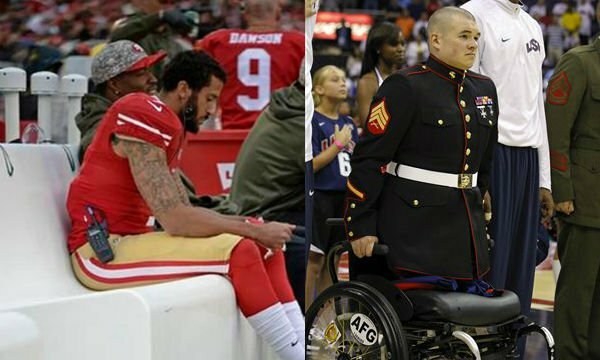 A growing number of Americans are outraged by Nike’s decision to sign former NFL quarterback Colin Kaepernick, who initiated the disgraceful protests against police, our flag, and the military in 2016 that continue today, to a multi-million-dollar contract to become the ‘face’ of its newest ad campaign. As such, there is a growing counter-protest taking shape in the form of a boycott against the company (under the hashtag #BoycottNike) that is spreading like wildfire across the country in response to the outrageous campaign which, as you might expect, is designed to be a slap in the face of every American who cherishes our traditions. One counter-demonstrator who posted a video to Real.Video explained that despite Nike’s growing anti-Americanism through the years coupled with moving jobs for the manufacture of its overpriced sneakers out of the country, he has nevertheless continued to support the company. Shares of Nike were down by as much as 3 percent on Tuesday, after the sportswear giant chose anthem-kneeling activist Colin Kaepernick as the face for the 30th anniversary of its iconic “Just Do It” slogan. Kaepernick was the first NFL player to kneel during the national anthem, an anti-American political protest that sparked a backlash against the sport and sent ratings tumbling. Kaepernick also sported socks depicting police as pigs at team practices and wore t-shirts celebrating Cuban communist dictator Fidel Castro. His own statements countermand that argument and in fact, demonstrate that he believes pride in our country is automatically racist. In addition to #BoycottNike, the hashtag #NikeBoycott is also trending on social media. It’s not clear if the financial hit will be prolonged or not, but why a major corporation would once again choose to blatantly offend arguably a majority of customers and potential customers is baffling, given that a corporation’s main purpose is earning a profit and operating to the benefit of all shareholders. Others are also taking up the Nike boycott cause, including some well-known people like John Rich of the country music duo Big & Rich. Shortly after the boycott campaign was announced he tweeted at Nike to remind them of Kaepernick’s insulting police socks. “Hey @Nike I guess you made @Kaepernick7 your new ‘face’ of the brand because you love the way his socks look with your shoes? @Reebok here we come,” he wrote. He then tweeted another picture claiming that his “Soundman” just cut the iconic Nike ‘swoosh’ off of his Nike brand socks. “Former marine. Get ready @Nike multiply that by the millions,” he wrote. “When you compare police to PIGS, this ends the discussion for me. If you don’t find a problem with that, then feel free to unfollow me. The police JUST SHOWED UP at our concert to protect and serve, I’ll ask them what they think and get back to you…” he added. Kaepernick does have one notable fan, however: Former Iranian President Mahmoud Ahmadinejad, who has often denied the Holocaust and who suppressed Iranians. Read more about libtard corporate behavior at Libtards.news.